Future Don explains to the TMNT, Ninjara and Splinter how New York City came to be flooded due to the Greenhouse Effect. The floods caused the rats of the city to move higher into the buildings of the city, creating a huge problem. Future Don worked with a cat mutant named Manx to devise robots that would kill the rats, and the two were very successful. 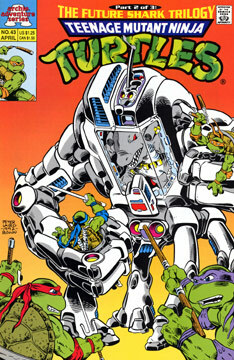 Too successful, as their machines earned them the ire of the Rat King, who attacked the TMNT relentlessly. The Turtles eventually chased Rat King and his remaining minions away. Future Don and Manx became extremely wealthy, thanks to their robots’ effectiveness. But Manx wanted more than wealth, he sought immortality as well – and he devised his own cybernetics that he used to “enhance” himself. Unfortuntely, the biomechanics altered Manx, he changed his name to Verminator X and began to steal things and kill anyone who tried to stop him in the pursuit of his goal. Of course, Verminator X had a falling out with Future Don, who began his own research on time travel. Don had initial success using the Eye of Sarnath as his power source, but the demands of the machine soon depleted the Eye and Don needed a new power supply. Future Don began work on a new Time-Slip Generator, as he knew his old one was only good for a few more uses. Unfortunately Armaggon arrived and stole the original time machine. Don then finished work on his second Time-Slip Generator, only to be assaulted by Armaggon, Shredder and Verminator X, who stole the new machine as well! So Future Don then set about building his thrid time machine – which he powered with normal electricity to go back in time and retrieve the TMNT of his past so they could help him and Future Raph stop Armaggon, Shredder and Verminator X. While Future Don is telling his tale, Future Raph corners his past self and asks him to learn to lighten up and appreciate his friends and family. Naturally, Present Day Raph gets upset. Meanwhile, Armaggon is completing work on his Time-Slip Generator, powering it with nuclear fuel, the bones of the Roswell Alien, Hitler’s brain and the White Stone of Mecca. Future Don then gathers our heroes together so they can use his time machine to ambush Armaggon, Shredder and Verminator X. As armaggon loads the White Stone into his Time-Slip Generator, the portal screen begins to radiate with energy – and our heroes leap thorugh and attack their foes! A battle erupts as Armaggon arrives in a gigantic exo-skeleton, but the Turtles defeat it easily. Armaggon leaps from the mech and grabs Leo, bolting towards the Time-Slip Generator. The shark man takes Leo through the portal, with Future Raph, Raph and Don in close pursuit. On the other side of the protal, the Turtles find themselves in a swamp – with no way back and no sign of Leonardo or Armaggon.